When thinking of funeral doom few bands hit the top of the list. Many can be named but only a select few come instantly to the mind. Shape Of Despair are one of these bands that are linked with one of the most underground and appreciated genres in the world today. Its still in its infancy even though its been playing in peoples ears for over 2 decades. Atmosphere, sorrow and beauty are just a little list of what Shape Of Despair bring to the table!! On today’s epic show we are joined by vocalist Henri who helps gives us an insight into the minds and the music of the band. Henri also fronts the band “Throes Of Dawn” and speaks indepth of his involvement in each of the bands. What its like playing live, The music scene in Finland, the possibility of getting Shape Of Despair over to the Uk for a special show! Plus a hell of a lot more!! Check out http://www.shapeofdespair.com/, https://www.facebook.com/shapeofdespairofficial for more information on the band. 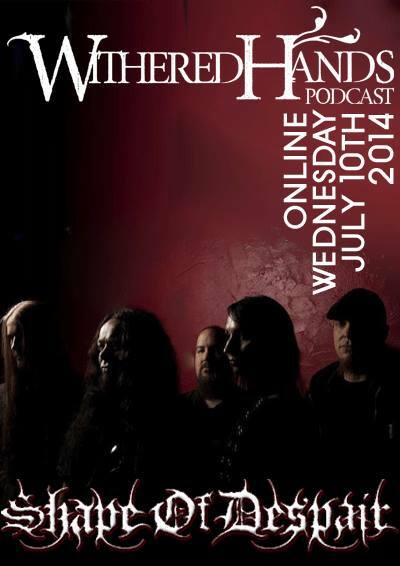 So sit back and enjoy this installment of the ever growing Withered Hands Podcast. Be sure to like us on our facebook page and comment on this or any of the previous shows!